Looking for the perfect way to show your appreciation? Or a special gift for your child, grandchild, family member, friend, classmate or co-worker? 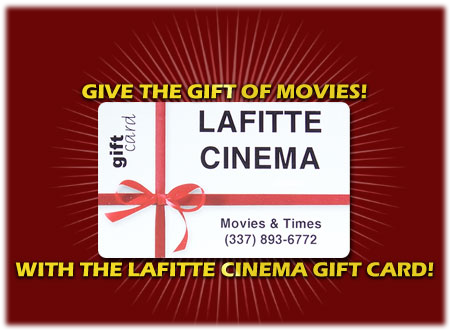 An electronic Gift Card from Lafitte Cinema makes a PERFECT GIFT!! Give them the gift EVERYONE loves! Give the gift of movies! Accepted at the Boxoffice AND the concession stand! Available in ANY denomination – Use just like cash! Lafitte Cinema Gift Cards NEVER Expires! – No Service fee!